I had the belated, long-postponed, very intense pleasure of attending one of Lili Singer’s Thursday Garden Talks held by the Los Angeles County Arboretum, a tradition going back ten years. 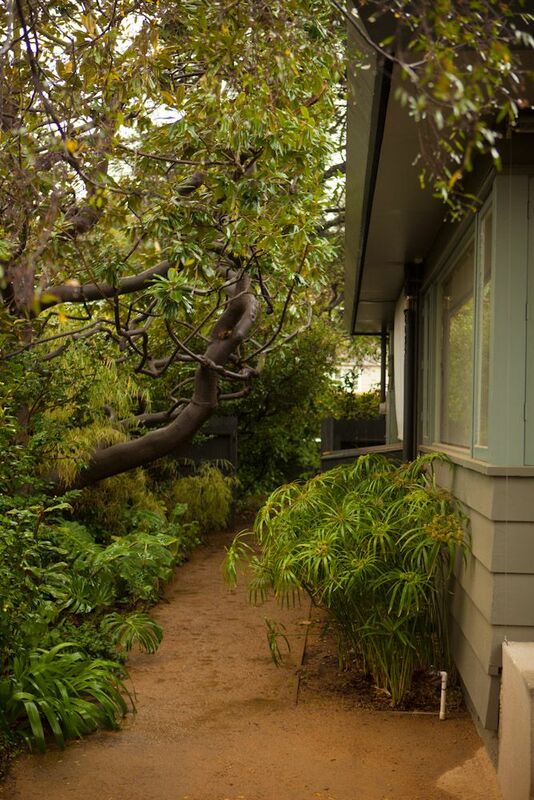 Lili Singer has long been so embedded and enmeshed in everything that is good about Los Angeles gardens and garden making that it’s impossible to untangle a first awareness of her. I know of Lili primarily from her public radio broadcasts on KCRW called simply “The Garden Show,” which spanned the years 1982 and 1996. Her Thursday talks at the arboretum never jibed with my work schedule, but I kept abreast of the talks through The Los Angeles Times weekly Datebook, serene in knowing that such fine things were taking place. And then The Los Angeles Times cancelled the wonderful Datebook section, and that news blackout startled me into action, a bleak reminder to take advantage of the good things while they last. 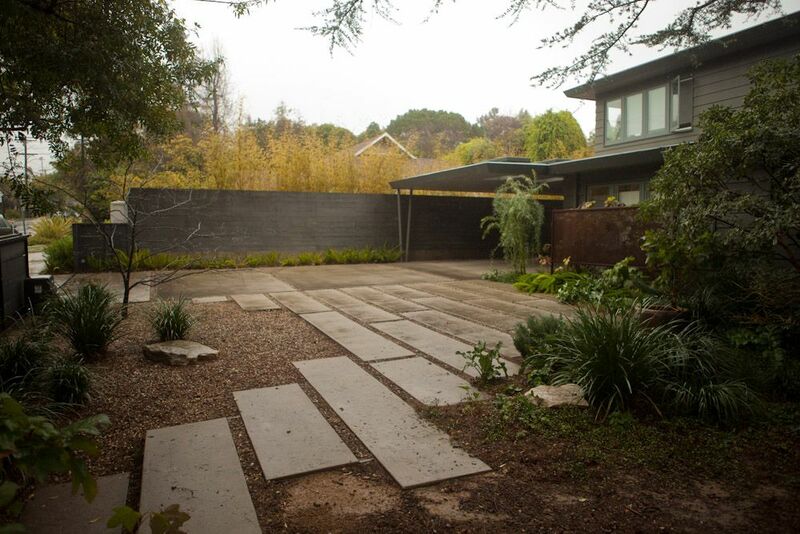 Yesterday’s Garden Talk took the form of a tour of three Los Angeles area gardens. Photographer MB Maher is in town briefly and tagged along on the tour as chief photographer and navigator. Rain had caused the freeways to spasm and seize up, so we shamefully straggled in five minutes late, which turned out to be earlier than most of the other attendees who were also caught up in rain-panicked traffic. Lili said this was the first time in ten years that one of her field trips saw rain. Nothwithstanding the atrocious traffic, I loved it. January rainfall in Los Angeles means all is right with the world. This landscape was designed to soak up every precious drop. Taking shelter under the carport. 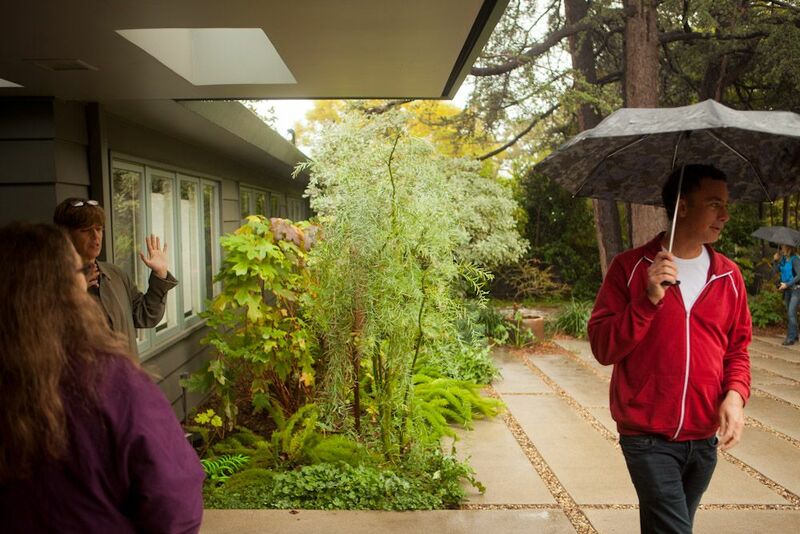 One of the garden designers from Grow Outdoor Design, Joel Lichtenwalter, with umbrella. 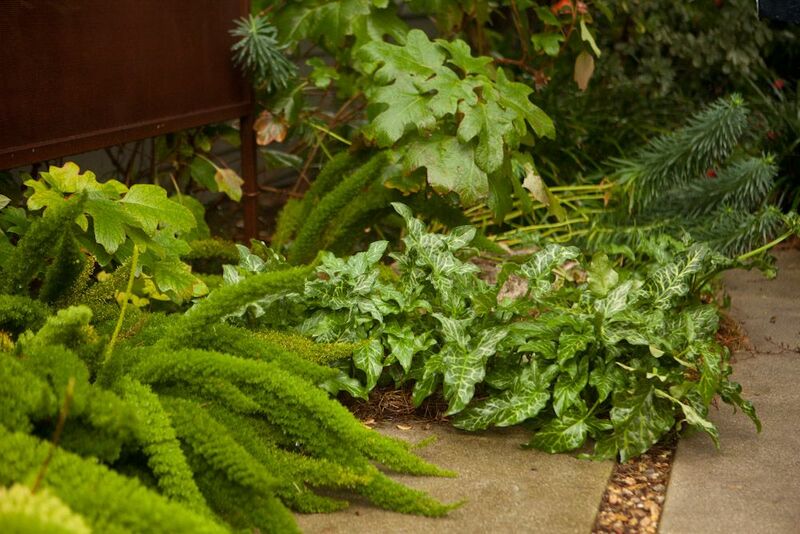 Not often seen in local gardens, the marbled leaves of Arum italicum ‘Pictum,’ an enthusiastic spreader, with asparagus fern, euphorbias, and oakleaf hydrangeas sprawling at the base of a privacy screen. Leafless Cercis canadensis ‘Forest Pansy,’ one of several throughout the landscape, and front driveway. 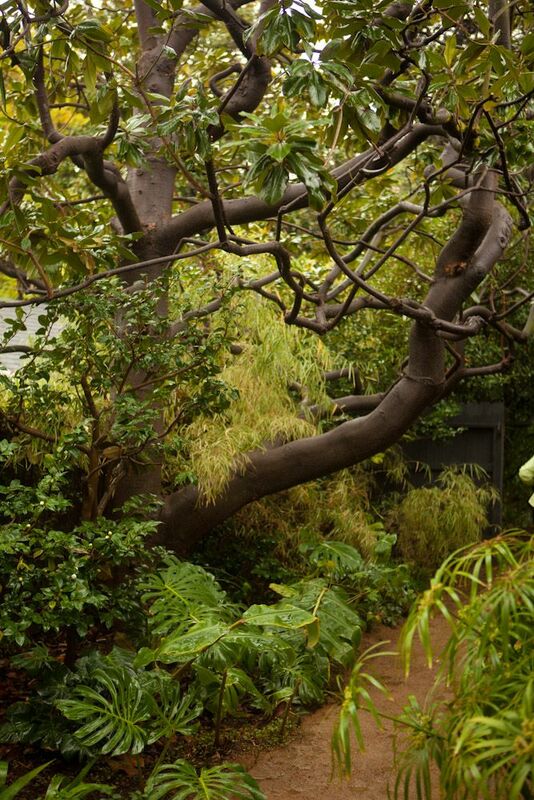 Around the corner into the back garden, past the twisted trunk of a magnolia gleaming dark from the rain against what looked like a Mexican Weeping Bamboo, Otatea acuminata aztecorum, but I didn’t verify the name. The decomposed granite pathway had already soaked up all the overnight rain. 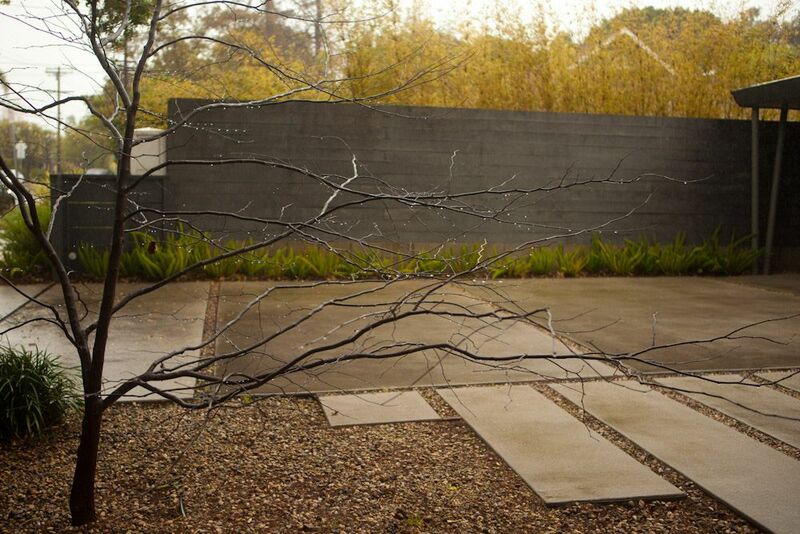 The back garden was sleek and simple, a retreat designed to honor existing trees and the needs of a growing family, with the central area kept mown lawn, a glimpse of which can be seen here, bounded by the encircling walkway of decomposed granite. 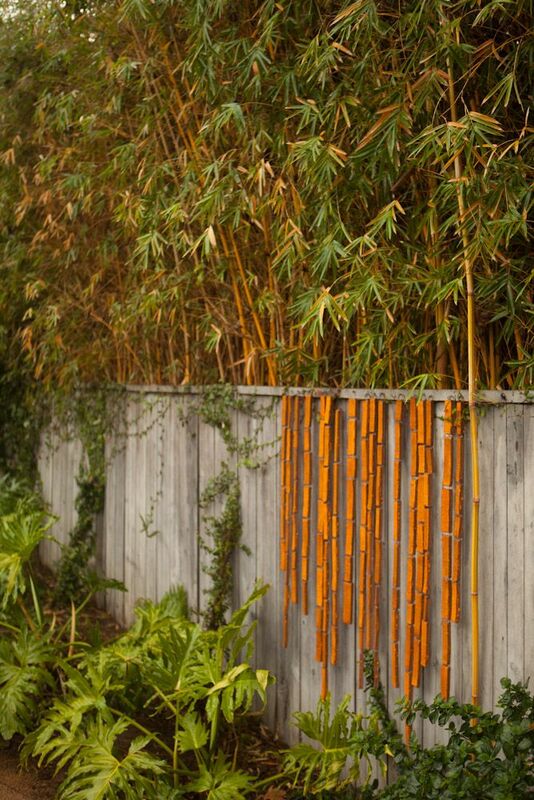 The power of restrained use of ornament: The owner’s brilliant choice of ceramic tiles by Sam Stan Bitters, which deftly emphasize the orange culms of the towering bamboo growing behind the fence in the neighboring property, claiming ownership and inclusion of a “borrowed” view. I wish I could provide a website for Mr. Bitters’ work, but none could be found. The owner’s choice of chairs was equally inspired. The weight of just one of these chairs was more than I could single-handedly support. 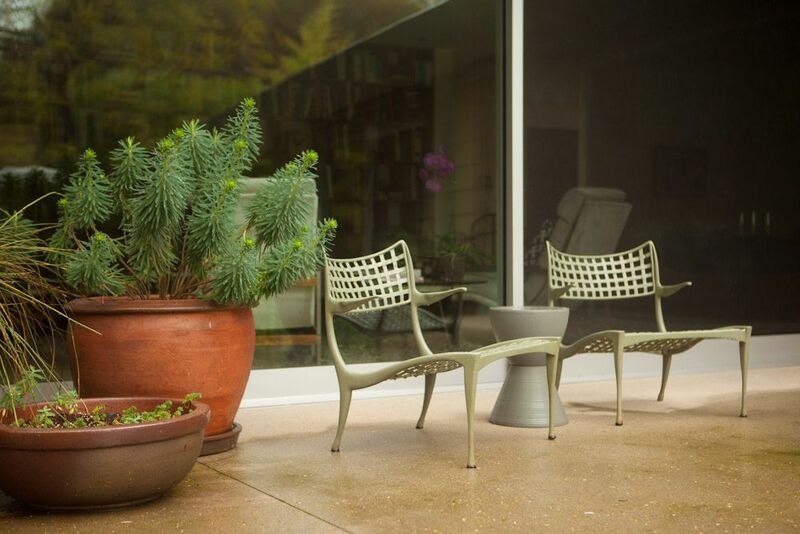 The owner’s penchant for Mid Century Modern design is also evidenced by the choice of the Circle Pot, designed by Mary and Annette at the Atwater Village shop Potted. 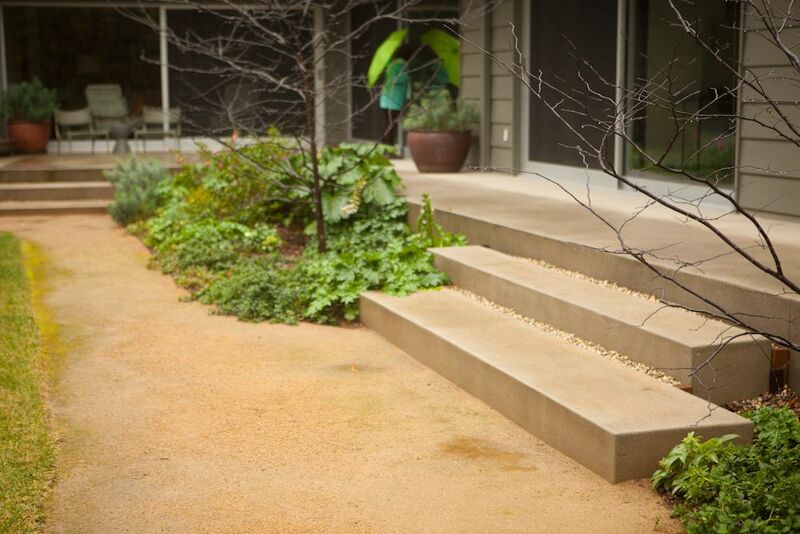 The garden designers worked closely with the architects, continuing the architect’s use of concrete as the medium for the steps descending from house to garden. 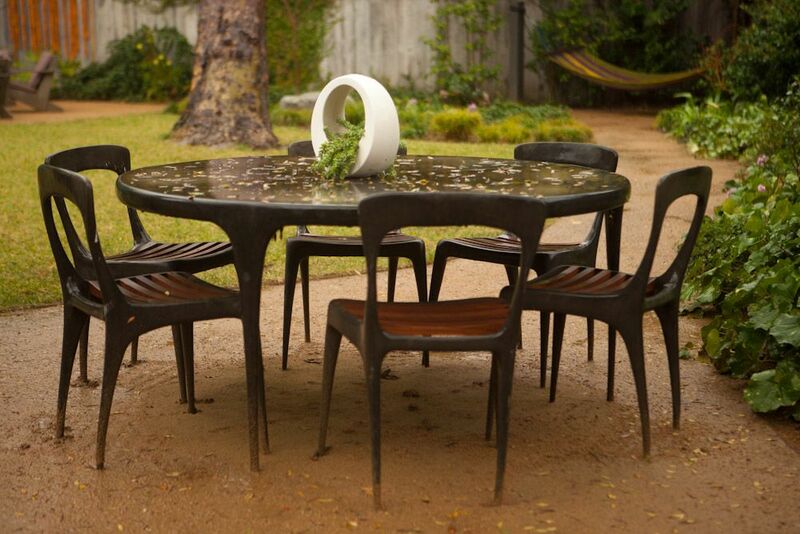 Chatting about plants and design is the perfect use of a drizzly January morning. So very, very glad I finally decided to attend one of Lili’s Garden Talks. From now on, I’m hoping to make it a standing Thursday appointment. 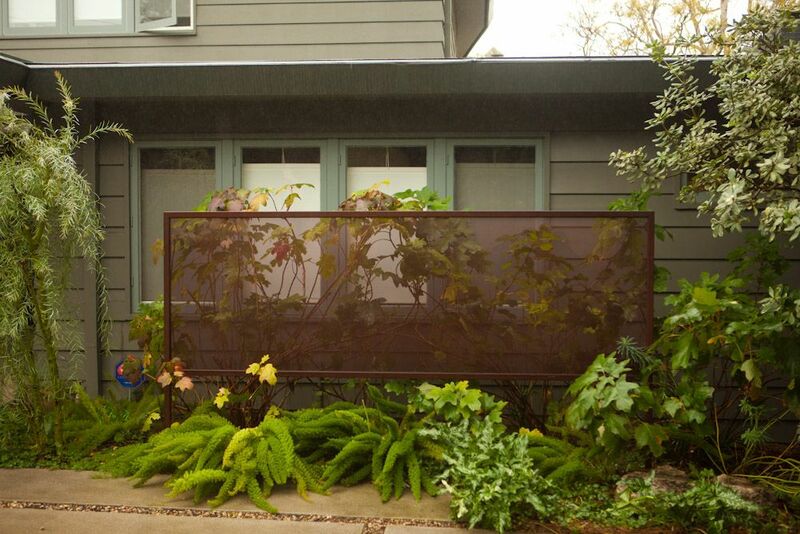 More photos of this garden can be found on the website of Grow Outdoor Design. 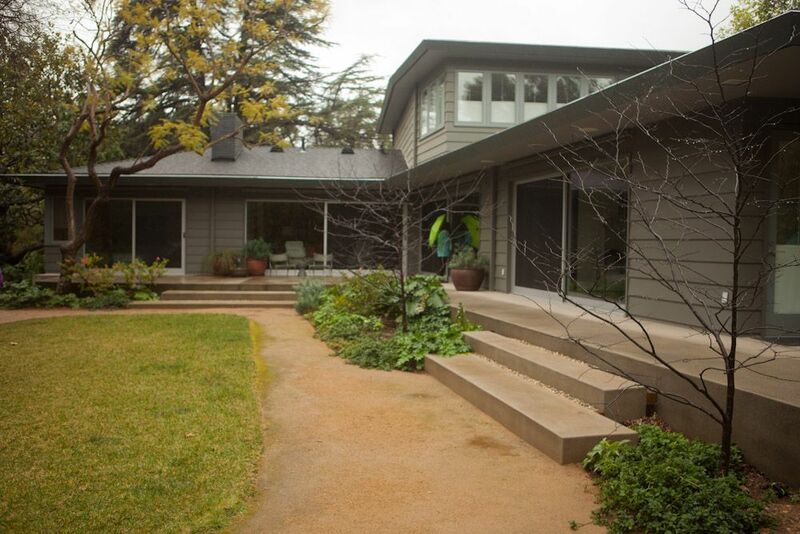 This entry was posted in design, driveby gardens, garden visit, MB Maher, pots and containers and tagged Acacia iteaphylla, Arum italicum 'Picturm', Cercis canadensis 'Forest Pansy', Circle Pot, Grow Outdoor Design, Joel Lichtenwalter, Lili Singer, Los Angeles County Arboretum and Botanic Garden, mid century modern, Potted gifts for the garden, Ryan Gates, Stan Bitters. Bookmark the permalink. 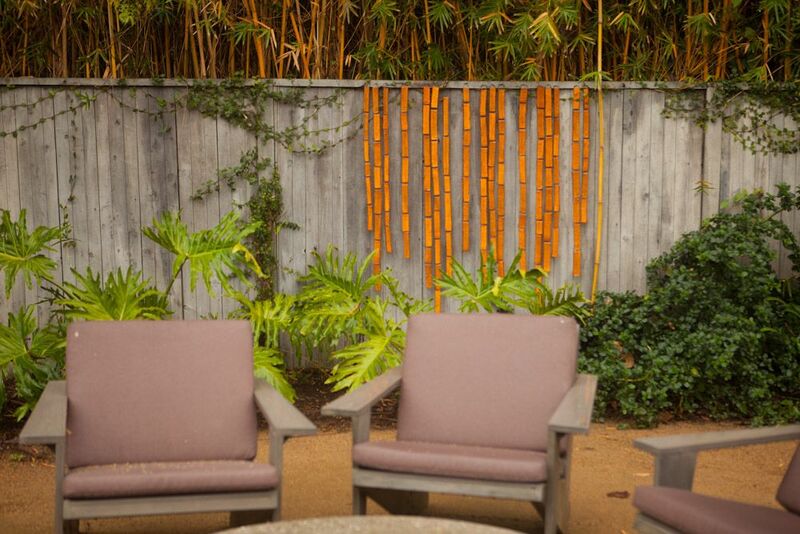 So many great features in this garden! 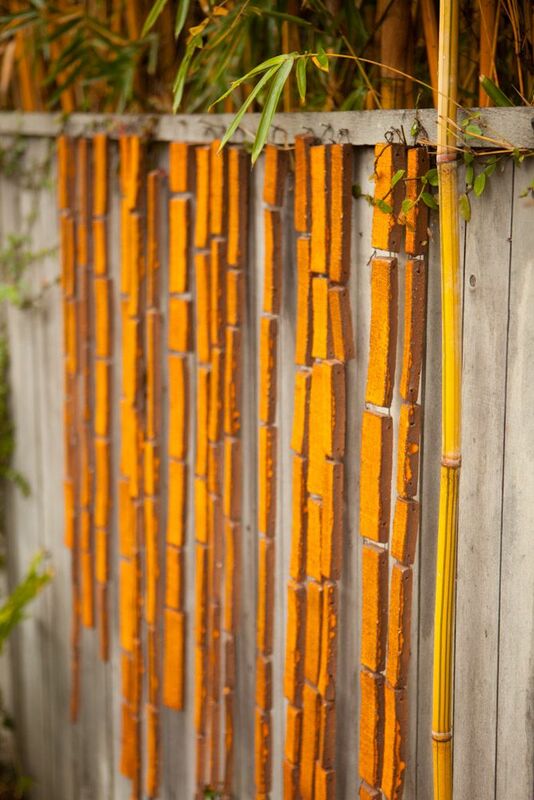 I love the ceramic tile art on the fence in front of the bamboo — that’s a clever play on color and texture. 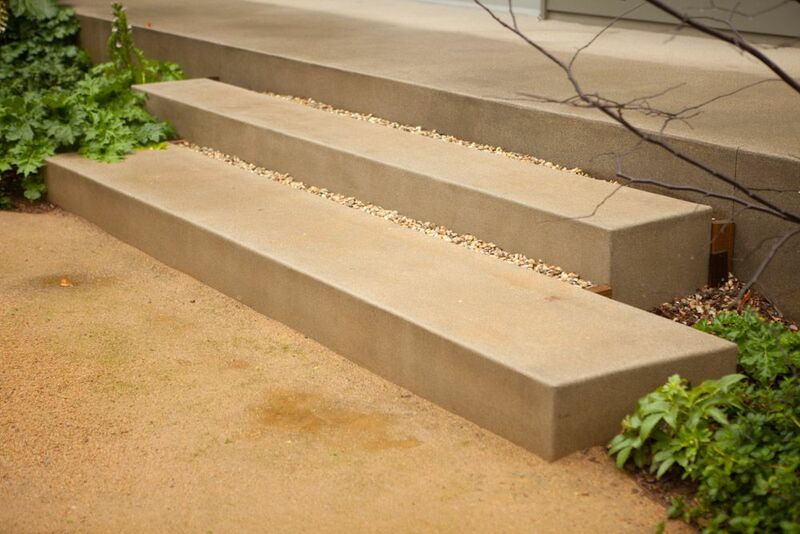 The seating and concrete paving are marvelous too. The plants aren’t half-bad either. 😉 That muscular magnolia trunk, for ex. Pam, that magnolia has some Michelangelo musculature, doesn’t it? Lena, I am in your debt! Thanks so much for the correction and links. Thanks for sharing your tour. 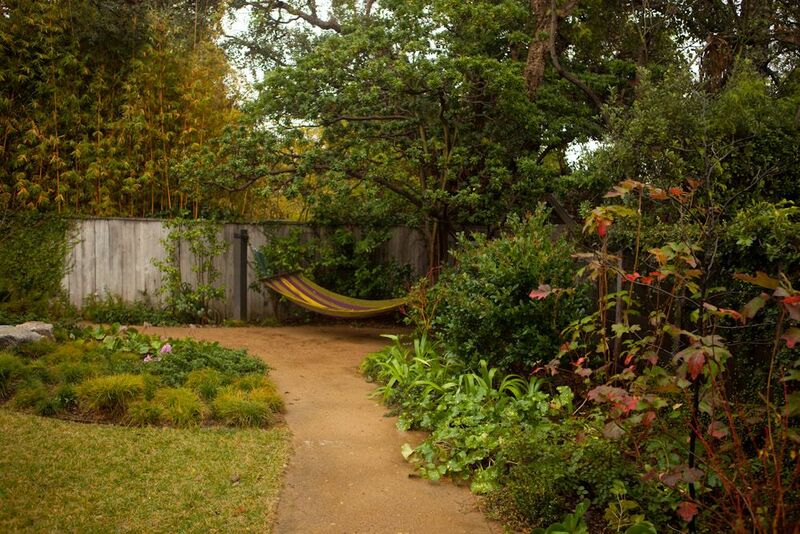 The garden has a restrained and tranquil feel to it while still having a lot of interesting plants. Lovely place without screaming “style!” too loudly. Thank you for the tour. Magnifique, but bring us Mitch back, now ! Is Cercis ‘Forest Pansy’ commonly grown out your way? I had a beautiful one in the front yard that just decided not to live through winter a couple of years ago. So far I have not replaced it. 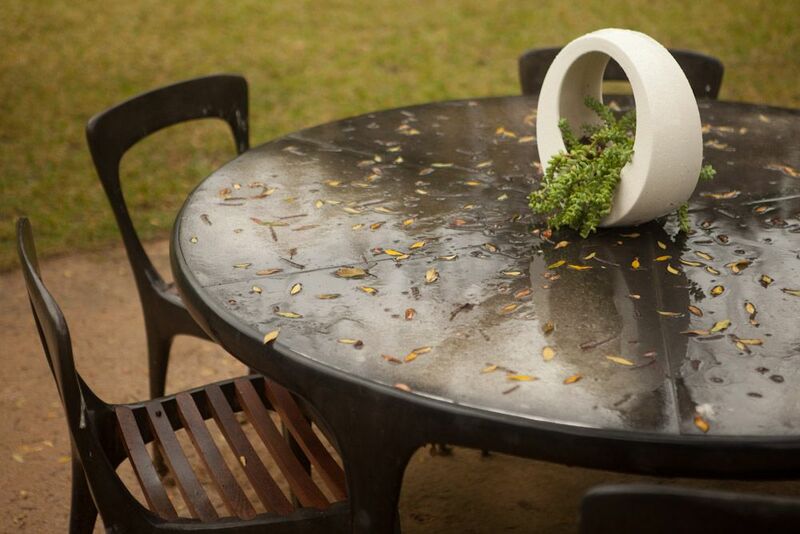 Rain always puts a nice spit polish on the garden. Thanks for taking me on the tour. Sue, yes, cercis is grown here, tho I’ve never grown one myself.